Impression 1 : Lebuh Katz looked sleepy and quiet even at 9 in the morning. Ocassionally a moped or a trishaw would linger past leaving some trail of life. This row of shophouses seemed like the only ornate fixture in this working class neighbourhood with worn down houses that look utilitarian and lived in. Interesting trivia : As I suspected, the street has a German connection. It was named after the German born Katz brothers who established an import business in George Town in 1864. When I learnt this word in my German class, I remember being instantly enamoured, repeating it several times in class, on the tram, in shower, enunciating it, rolling it around in my mouth to acquaint myself with its nuances, volleying it with my tongue, exploring its soft corners and rough edges and then carefully putting it back in my vocab chest, like a vintage fountain pen with gold nib and sterling silver filigree overlay, something valuable that you take out only on special occasions. And when you do, you put on a show. You bask in the smug glory of the wonder ricocheted off others’ faces. Then you put it back in your armour again. Such is the word ‘zufrieden‘, which may mean satisfaction in English, but doesn’t feel or sound as hackneyed. Impression 2 :The owner of the shop whose corridor I had blocked came out to survey soon after I had set up. Instead of shooing me away, he moved his bike aside so I could have more elbow room and then he showed me the tap from which I could draw water for painting. This was accomplished with a lot of gesturing as he didn’t speak English and I don’t speak Hokkien. Impression 3 :Row of Shophouses on Lorong Stewart. Everyday after workshop ended at 6, I would rush back on the road to utilize the 1.5 hours of leftover sunlight in sketching whatever caught my eye. This time, I was plonked on the floor of another 5-foot way, lined with several fancy restaurants. People sauntered past me, wearing shiny clothes and expensive perfumes. I remember making the ushers really uncomfortable. Sometimes a foreign tongue can elevate the meaning of a word you’ve heard all your life and transform its ethos into something grand just because it sounds luxurious in your mouth and tantalizing to your ears and also because you didn’t have enough time and occasion to wear it out. What I mean is, I may use ‘satisfied’ to indicate my experience in using the newly opened restroom at the airport, but use ‘zufrieden‘ while reminiscing about a sketching trip to George Town in Penang, that I returned from. To explain why, I have to reiterate that it was my first overseas trip where sketching was the actor in leading role and travelling was the supporting sidekick, not the other way round, like always. The priorities were flipped and the result was glorious. This epiphany doesn’t mean travelling takes a backseat. I am the parent that’s trying to advocate equal love for each child. Impression 4 : When I saw this Red Trishaw parked on Armenian Street, I was compelled to sketch it, simply because of this composition. I found a shady spot beside an Ice Kachang lady who initially tried to sell me her ware but later took the responsibility of shooing people away from my line of vision, including tourists. Halfway through the sketch, the red trishaw left, only to be replaced by another in few minutes but this was parked the opposite way. In an attempt to get it done, I was trying to laterally invert the vehicle in my mind and then draw it. When the trishaw driver, quietly lunching beside me got a whiff of my frustration, (I may have been muttering to myself), he got up and to my utter disbelief turned the heavy vehicle around just so I could finish my doodle and declined to take tourists for rides till I finished. When I thanked him, he just nodded. And the Ice Kachang lady dragged her son out of the house to show him my sketch. She seemed proud. 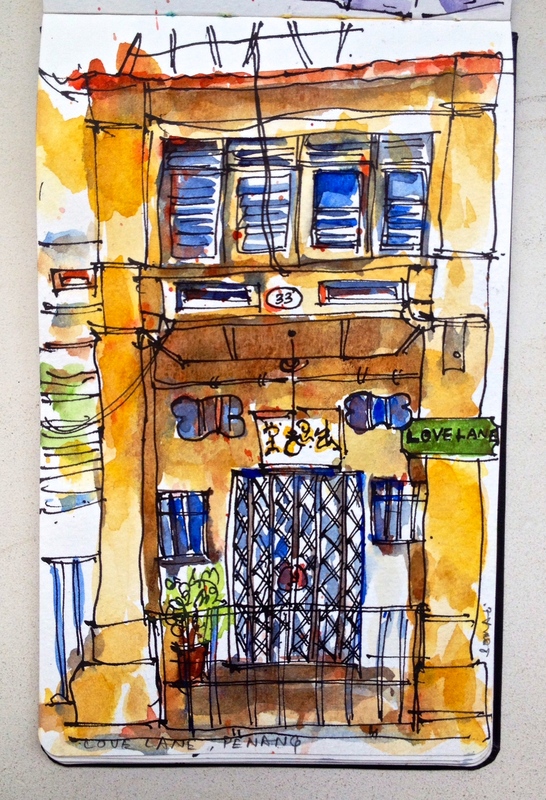 Impression 5 : I was sketching this aged beauty from a ruined torn down shophouse, right opposite when my husband said, there’s nothing indicative of ‘Love’ on Love Lane. Well, 19th century sailers and soldiers who made a beeline for the brothels lined up here would’ve differed. The amorous frolics of yesteryears have been replaced. Love Lane looked quiet, desolate and monochromatic that evening, except for a gaggle of tourists gathering around cafes chit-chatting about guesthouses, wi-fi, backpacking and travel. Perhaps somebody will talk about Love. For me, travelling isn’t just fun, it is also an yearning. The fact that I feel more happy, and alive on the move is established and I don’t second guess it. What is travel’s worth in one’s life can be gauged from the motivation to travel. Is it to break away from the mundane seeking ‘change of scenery’, or to relax and recoup before you go back on the hamster wheel, is it to check off places from Lonely Planet’s 1000 places to visit before you die , is it to reclaim your twenties because you’re about to step into your 30s? Or is it that unsettling lifelong ‘need’, not a want but a need, right out of Maslow’s heirarchy, that thrusts you into the unknown from time to time? Impression 6: China House, a beautiful shop house turned cafe has tables that are covered in white paper. A small bucket of crayons is set on the table for you to scribble while you wait for your meal. This sketch is colored using the same crayons. For dinner, I had spaghetti with grilled chicken and sadly, it was a let down. The pasta was overcooked and flavours were all over place. The lime soda with mint and mango slices was a disaster – I have never tasted anything so incongruous. But DO NOT leave this place without trying the ginormous slice of out-of-this-world Tiramisu. I have a feeling desserts are their strong suit. My motivation to travel, my ‘need’ to travel, comes from my insatiable inquisitiveness to see, explore, thus discover and know. I believe, we are all inquisitive, differing in the intensity, perhaps. I mean, don’t we all like to take a peek, a swift glance into other’s living rooms through their open windows at night or others’ plates in a restaurant or try to read the label on a bag hanging from a stranger’s shoulder, try to peel off the discounted price sticker on a garment to reveal the actual price or take a peek at the answers behind the Math book? The apogee of my German learning classes in Munich, was the day I could understand overheard conversations on the tram. It was as if a stubborn blocked nose had cleared and I could smell the roses again. Untill then it was unfathomable background noise instead of funny jokes, twee endearments, silly fights or crass comments. If you are inquisitive to such a degree, then travelling is one pursuit that requires each of your five senses to be in a constant state of high-alert. You are a walking sponge, absorbing an overwhelming amount of information sent by your five, foot soldiers who are working in a frenzy. 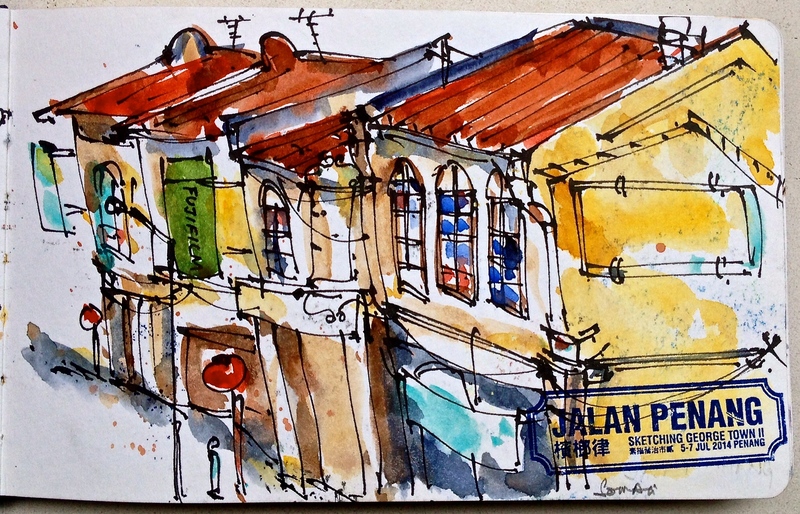 Impression 7 : I sketched this row of Shophouses on Jalan Penang – an important thoroughfare during the colonial era – from the Komtar pedestrian bridge. 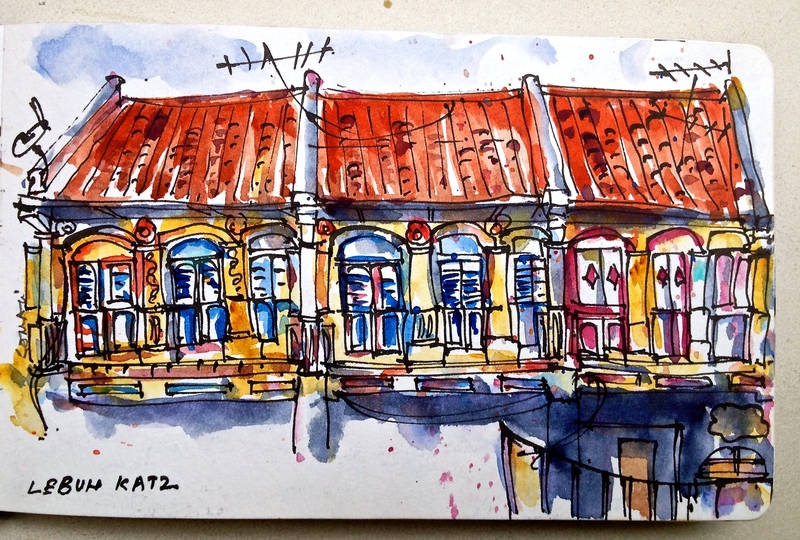 Shophouses in different stages of restoration like in this sketch is such a common sight in Penang. One crumbling and abandoned shophouse shares a wall with its fully restored neighbour, housing a bustling guesthouse or a cafe or a bistro in full regalia, which in turn shares its wall with another that is being mended and prettied up for better prospects. The famous Teochew Chendol sold at the junction of Keng Kwee Street is only a few minutes away. The Assam Laksa sold there is fresh and flavourful. Now let me add another dimention to this self-absorbing pursuit called travel. Suppose you’ve been quietly nurturing the habit of documenting your life, the sights and sounds around you on a regular basis in a sketchbook and have been taking immense pleasure out of it. Yes, it’s been two years. Darn, you’ve even gotten good at it. It has brought you joy, won you friends across the world and admirers who say how much they love your ‘style’ (to which, you have chuckled more than once muttering smugly and questioning at the same time – “I have a style? I have a style!”). Impression 8 : Any visitor to Penang will be awed by the potpourri of architectural styles – Early Penang Style (1790s – 1850s), Southern Chinese Eclectic Style(1840s – 1900s), Art Decco style (1920s), Anglo Indian Style (3rd quarter of 19th century) to name a few – representing various periods of the city’s history. It’s like a rainbow cake, each layer unique and different. It’s interesting to view two buildings standing side by side that may have been built in different centuries! 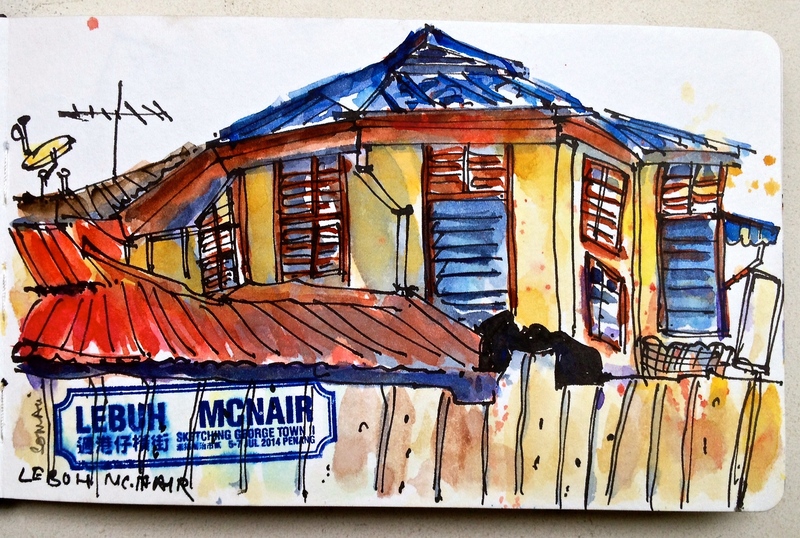 I sketched this house on Lebuh MacNair because its architectural style seemed different from the two storied pre world war shop houses peppered across the city. It is probably an Indo-Malay bungalow but I can’t be sure. You’ve showed your work at exhibitions, and sold. Yes, somebody actually paid money to hang your creation on their living room wall. You’ve counted the money gleefully, but you’ve also felt the pang of loss. It’s complicated. Nevertheless the burning question is what do you do with this situation of yours, when you travel? Do you accomodate it because it’s becoming second nature or do you abandon it lest it comes in the way? 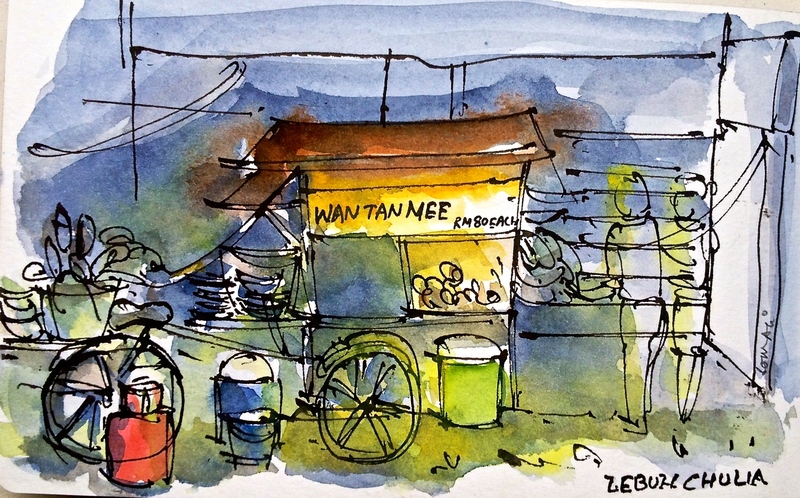 Impression 9: In the darkness of the night, this Wan Tan Mee pushcart twinkled like a firefly on Lebuh Chulia. In the pale bulb light I could make out a stooped figure handing out steaming bowls of springy noodles with soft wantans floating in an irriesistible dark sauce. The whole shebang was in the open, with pots and pans, buckets, gas cylinders strewn all around. Business was hot. From the enormous queue snaking around the stall, anybody could gauge its popularity. 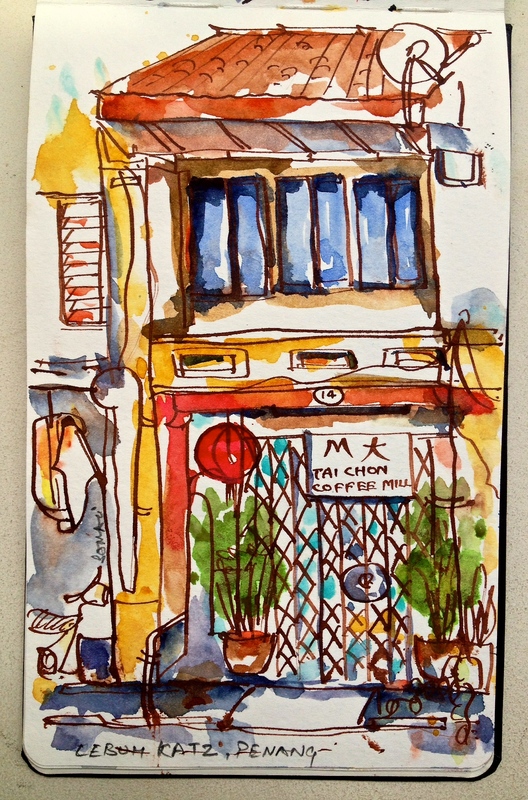 Impression 10 : Shophouses make such great subjects for sketching. Even across similar architectural style, each house seemed unique and full of character. Swatow Lodging house at no. 16, had all its windows closed. The worn out facade had pockmarks of mildew, faded and peeled paint. The ground was covered in weed. A whole lot of trash – dust covered broken and discarded furniture, toys, cardboard boxes was strewn right across its doorstep. But nobody seemed to care. It was even atmospheric, perhaps exhibited as such deliberately to recall vestiges of the past. After all ‘heritage’ is a fast seller among tourists. 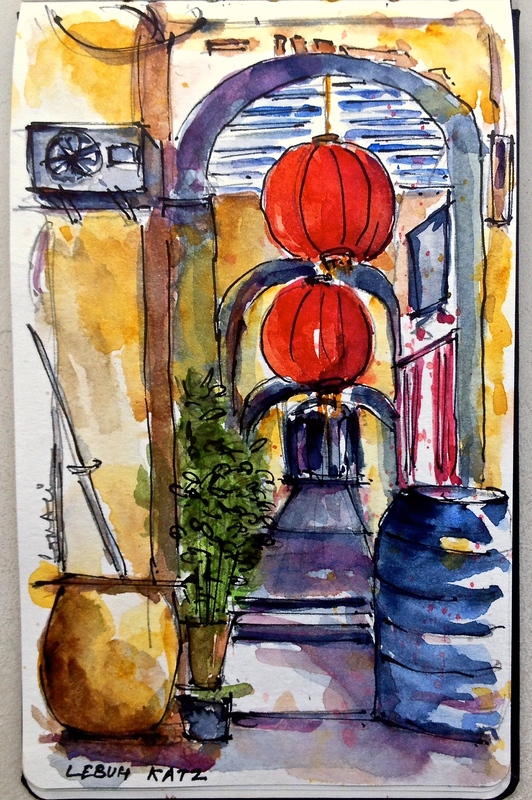 For a shophouse sketch fanatic, which I am, Armenian Street has plenty to offer. I picked this one to spend my time on because it stood like a little punctuation mark after a long sentence of shophouses. If you are inquisitive, you probably have been badgered by the ‘let’s see what happens’ shtick. That’s what I caved in to. I carried my sketchbook everywhere I travelled to see how it felt. And surprise surprise! Sketching did come in the way I travelled, the way we – I and my husband were used to traveling all this time. Aching shoulders from lugging around A4 size sketchbooks and watercolours, making more and longer stops at sights than usual, leaving my partner to fend for himself while I doodled, battling the desire to sketch but moving on instead because, well..tick tock..tick tock, fighting the guilt of cutting on the ‘us’ time – looking into each others eyes, holding hands et al and feeding the ‘me’ time was what happened. Impression 11 : Spending even one night at the 1885 built colonial style Eastern and Oriental Hotel( called E&O) could be the highlight of Penang trip, especially if you find out that your favourite authors Rudyard Kipling, Somerset Maugham, Herman Hesse were fellow boarders. Every room faces the sea and the black and white floor of the opulent bathrooms will steal your heart. Do request for a heritage tour at the concierge – this will be your chance to view some of the original fixtures and furishings in the Heritage Wing rooms. But if something feels remotely right you hang in there, right? You see it through. Let the unsure wobbly wheels roll, in the hope of finding balance. Truth be told, I haven’t found balance yet, I still falter and fumble trying this third wheel to roll with us in tandem, on our travels, in our lives but guess what, it is getting easier by the day, week, month and year. And what more! I am reaping the benefits. Already. Impression 12 : While sketching Cafe 55 housed in a shophouse on Lebuh Pantai, we realized how narrow the roads in the historic district of George Town were. Soon we were betting if the next car could turn without grazing the parked car. There were few hits, but mostly misses. Too bad the rickshaws have been replaced. If you are a mercenary, do not read further. Disenchantment follows. Because the benefits which I am reaping, which many others before me have reaped and those who are yet to follow this path will reap in future is hopelessly Zen. 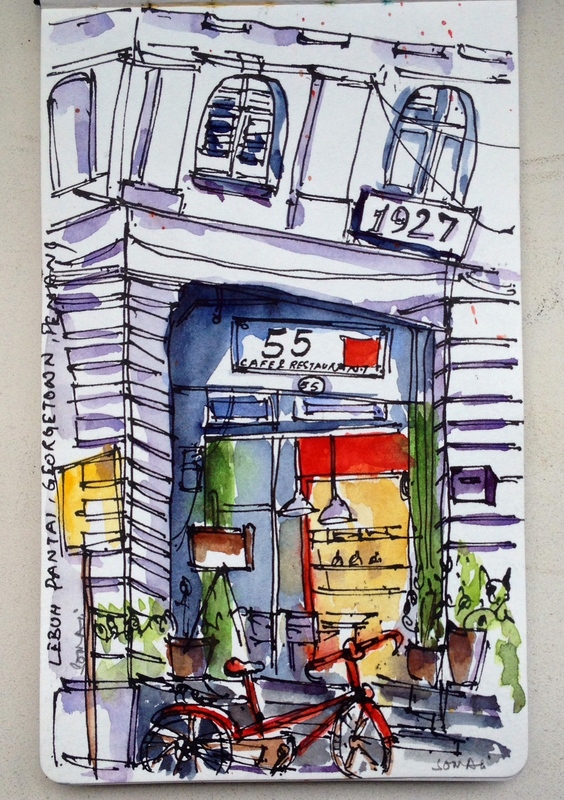 When I am sketching, specially on my travels, I connect with my subject and my environment much more deeply than I would have if I was merely visiting or passing by, because sketching involves intense observation. Impression 13 : If you’re sketching on the road, keep your privacy tucked away in the backpocket because you’ll attract people like flies to a candy. And your work of course is open to unsolicited criticism. 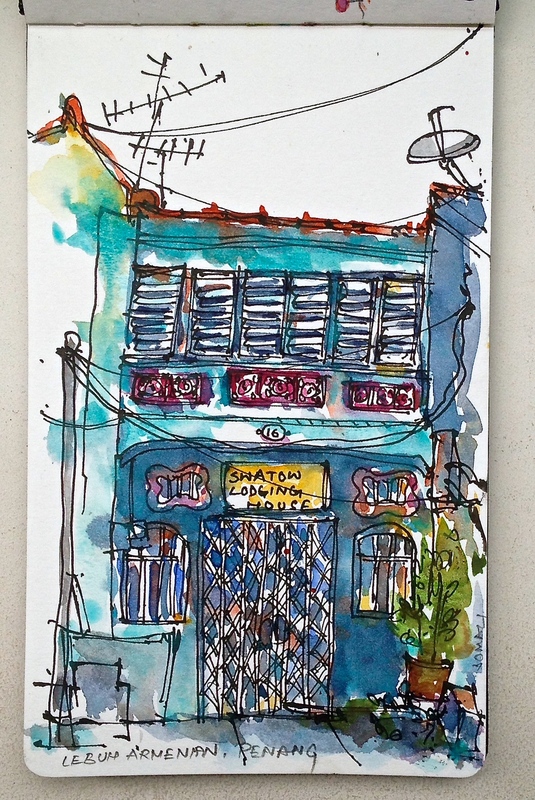 On this single occasion of sketching shophouses along Jalan Penang, I had an Indian migrant worker at my elbow the entire time, three families and a group of girls lingered and quietly took overhead shots. An elderly gentleman stopped by and said, ‘If this was up for judging , I would give you first prize”. I took off my oversized sunglasses and gave him a genuine smile. The smile was wiped off by the Korean tourist who requested for a photo of me with my sketch and kept me hanging while she fixed her lens and cleaned it before the shot. It invokes mindfulness, devoid of distraction, to such a degree that you participate in the scenery you are capturing on paper. Your fingers trace the eaves of the ancient temple roof, you knock on the louvered windows, ride the creaking bicycle, you flutter the laundry, skip the puddle on the fractured road and is caught up hopelessly in the nasty bunch of gnarly wires crisscrossing the facade of a shophouse. You become the pigeon sitting on the pole. Impression 14 :The Plantation Lounge at E&O has these luxurious chairs that will engulf you when you sit on them. In combination with retro reading lamps, a small library, choice of board games, free flowing coffee and tea, this place is a perfect hideout any time of the day. The constant sound of waves washing up the shore takes the experience up a notch. If you are staying here, don’t miss the elaborate breakfast options at Sarkies. For the first time in my life, I ditched toast and omelette for lamb curry and coconut rice for breakfast. Try a spoonful of roasted peanuts and fried anchiovies with it. 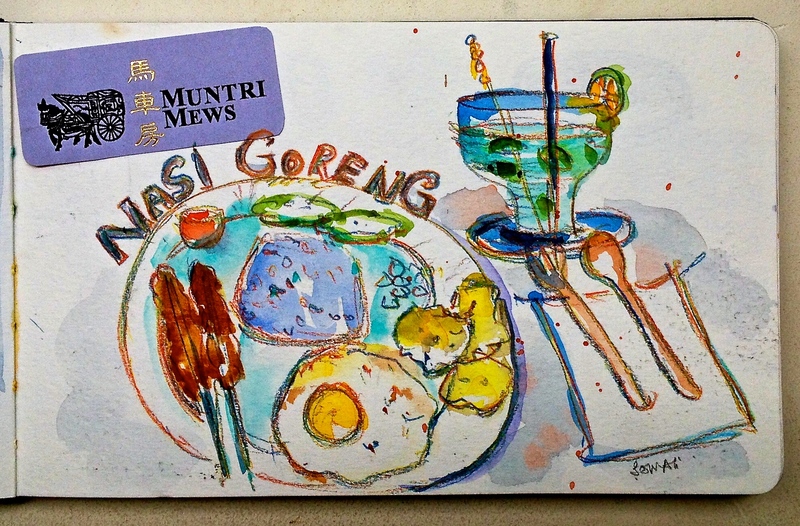 Impression 15 : Dinner at Muntri Cafe, on Muntri Street was rewarding after a day of sketching in Penang’s heat and humidity. We ditched the relaxing alfresco seating outlined by exhuberant green boughs for air-conditioning. Wiser choice perhaps, till it became dark, temperature dropped and those tiny tea candles on the tables outside were lit up. It was romantic, but we weren’t there. Then came the food. It wasn’t just warm and comforting but also delivered on taste and presentation. We snapped right back into the zone. “The courage- to-be, right here and now and nowhere else, is precisicely what Zen, at least, demands : Eat when you eat, sleep when you sleep! '” says Peter Mattheissen, in his book ‘Snow Leopard. Sketching lets you practice exactly that without even making an effort. When you travel through a destination, sketching slows you down, so you don’t just eat, but taste, not just look but see, not just hear but listen. And do you know what comes out of this beautiful partnership ? You are zufrieden, truly. Impression 16 : The owner of this coffee mill on sleepy Lebuh Katz hadn’t opened shop yet. But that didn’t stop him from keeping us company and conjure a ‘thumps up’ from time to time as the sketch progressed and muttering in Hokkien – ‘beautiful, beautiful’. Impression 17: Right before our flight, we had dinner at Kaffa, which is at Penang Airport. The nifty decor and the ambience does not match food quality (we had Salmon and pasta) or the portion size. The drinks were pale and watered down with plenty of ice. The trip advisor sticker on the door has to really work its charm! Impression 18 : I am terrible at drawing myself! Anyway, this was the first sketch done at the event. 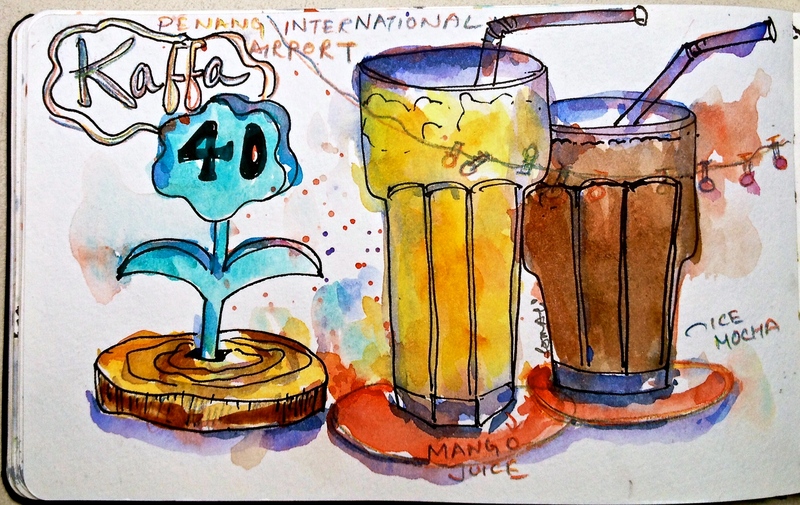 I have come back with 20 sketches from a 3 day trip to the UNESCO world heritage site of George Town in Penang, Malaysia. And since I slowed down on these 20 ocassions ( and almost all of these were off the tourist map) , I have 20 deep and distinct impressions of the city (see below each sketch) relating to it’s architecture, history, food, people, culture, ambience, temperament that someway or the other has characterized and demystified the place for me. I had first hand experiences which are real and personal. 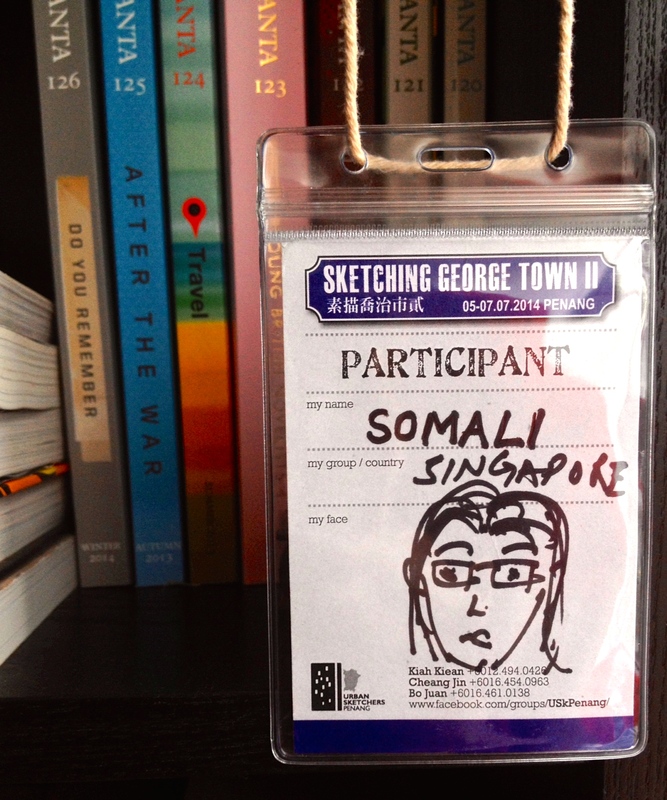 And I am sure, the 170 odd skechers from the entire South East Asia plus UK and New Zealend, who assembled here to participate in the USk SGT II (Urban Sketchers Sketching Georgetown II) event, experienced the same. 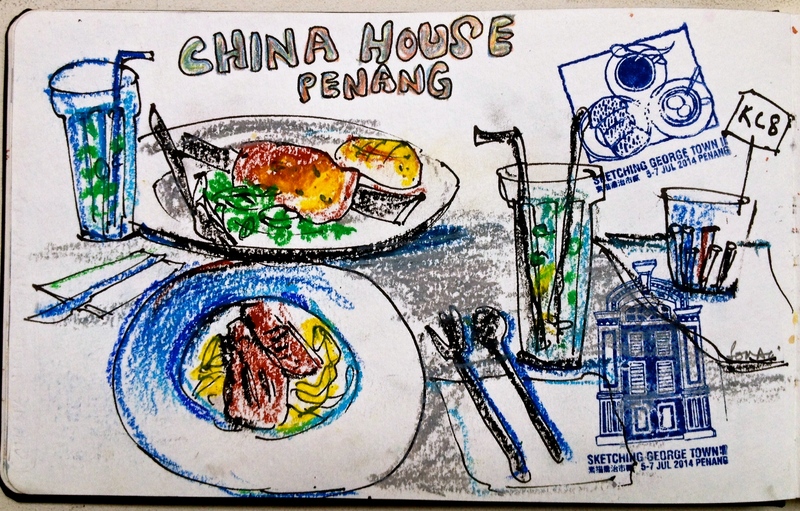 This entry was posted in Daily Vignettes, Travel Vignettes and tagged 5 foot way, Armenian Street, Cafe 55, China House, colonial, E&O, Eastern and Oriental Hotel, George Town, Georgetown, Heritage, illustration, Jalan Penang, Kaffa, Lebuh Armenian, Lebuh Chulia, Lebuh Katz, Lebuh Mac Nair, Lorong Stewart, Love Lane, Malaysia, Muntri Cafe, Muntri Mews, Penang, Penang Sketches, Shophouses, sketching, Straits Chinese, travelling, UskSGT II, Wan Tan Mee, zufrieden on July 17, 2014 by Somali Roy.